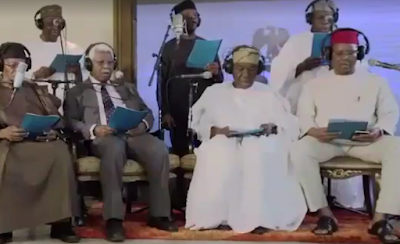 Nigeria’s Vice-President, Yemi Osinbajo teamed up with Nigeria’s former Heads of state, Presidents and Vice-Presidents to render a hymn for the new year. Osinbajo was joined by the likes of Olusegun Obasanjo, Yakubu Gowon, Ernest Shonekan among others as they rendered the popular christian hymn, “O God our Help In Ages Past”. Press play to watch it after the cut. Each of the leaders took their time to sing and offered a word of advice and prayer after rendering the hymn.